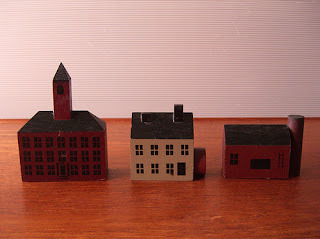 =Wooden school, house, and barn building blocks on my windowsill with bunch of plastic white animal figurines lined up behind!! Why building blocks?? I've always been obsessed with wood things and toys, and those two things combined makes me very happy....VERY happy...as if I'm a kid again. I can be happy with these simple basic toys. So happy that I don't even care whether I have a Wii, the Harry Potter Lego set, or the newest Bratz dolls (those things are absolutely appalling in every way)...what can I say....I'm a simple person who appreciates simple wooden toys. p.s. There's a folder on flickr dedicated to the whole project(click link for information) so as more people submit you can see more stories. So it won't just be about me anymore....thank goodness, because I'm starting to run out of materials!...that's actually a lie, because I can always talk about food! 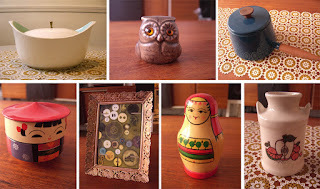 At Ladies and Gentlemen we do it because we believe in the longevity of objects. We hand pick each items because we believe that each object deserves a good owner who can appreciate its character, charm, and history. So our goal with Proj. 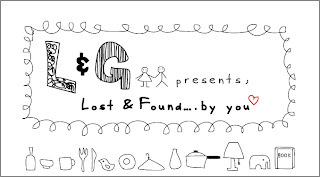 ‘Lost & Found by you’ is to celebrate this cycle of turning abandoned objects into found treasures by involving everyone to document the objects in their surroundings and write a short blurb about why they've chosen that particular item and how they're incorporating it into their lives. We hope that people will get involved and will find it interesting to read the stories and see the growing list about each object from everyone. What happens to the stuff we get for the store that's so awesome that we don't want to part with it? That's right, it stays right here to get packed into the few unoccupied corners of the apartment. Jean got a little overzealous this morning and started arranging things from our personal collection into color-coded still-lifes. It's a damn good thing she did 'cause look at these gorgeous shots. 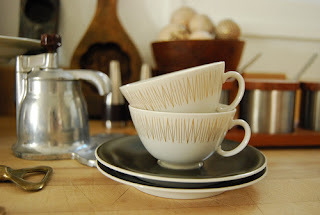 Taking the starring role is our recently acquired set of Kathrine Holm enamel pots and an enamel Finel bowl by Kaj Franck (the b&w one with mushroom motif). Yummo! 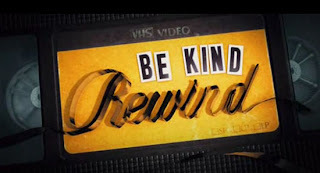 Be Kind Rewind premiers tomorrow!! 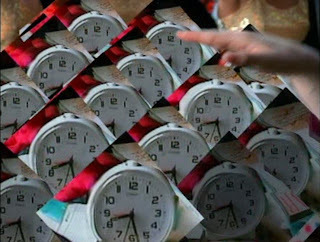 I'm totally physched about the new movie, Be Kind Rewind by Michel Gondry, who directed Eternal Sunshine of the Spotless Mind, The Science of Sleep and also countless of amazing music videos for Bjork, The Chemical Brothers, The White Stripes, Daft Punk, Beck, and many many more. Also gotta check the movie website. They magnetizes the internet and erases everything (don't worry...its not real) and then you see an arrow curor with a wire attached to it, and foam cutout letters that spells "google." There's also a trailer where Gondry erases the original trailer for the movie and he made a sweded version with him playing all the parts speaking with a French accent.... It's pretty perfect. New favorite find: Dieter Rams clock with a twist! So for Valentine's day I got inspired by some pre-made dessert packages from a Japanese store to bake some treats for Dylan as a Valentine's gift. I've always seen them, but never had a reason to buy them, so this was a great excuse to fulfill my urge to use these cute packaging kits! I got a red & white poka-dot chocolate box with locking heart tabs. It came with 4 chocolate paper cups, and a divider. I also got this packaging kit that came with 2 paper baking molds, a paper container to hold the cooked muffins, ribbon, a tag, and a plastic bag to wrap everything in. I found up a recipe from Martha to make these Brown Sugar Cherry Cakes, which were super easy to make. This cake recipe is a perfect blend between a muffin and coffee cake. It's got the fruity-ness of a muffin and the crispy top and the buttery-ness of a coffee cake. Two attributes that when combined together become something very dangerous....so dangerous that you won't be able to stop thinking about it. ahem, anyways, so this recipe is easy to customize. You can make it whatever flavor you want. I made some cakes with cherry, and some with raspberry jam to add variety. All I did was instead of the cherry, I poured a little cake batter into the cups, scooped a little jam in the center and fill the rest of it with more cake batter....and then you get raspberry flavor cakes! I want to try making more later with other flavors such as black sesame, ginger apricot, or green tea! The possibilities are endless! I decided to go with espresso flavor truffle covered in toasted almonds. Crunchy toasted flavored almonds with a little bitter coffee after taste...not bad of a combination. Quite tasty I must admit! I've just got featured on R.E.Load as one of their custom designers! Theres's a funny photo of me cross-legged! But I'm actually glad they used that photo versus the ones of me standing....where I looked like I had super short legs....as if they're not already short enough! I didn't think they would post it on the main page. Luckily it's not permanent. Phew! I just can't stand being so famous! ugh! So, I've been working for R.E.Load bags for 2 and half years or so doing countless custom designs of my own and custom graphic upon people's request. R.E. 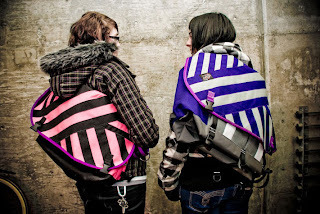 Load is the messenger bag company that sells awesome build-your-own bike messenger bags and they're all handmade in Seattle & Philadelphia. You can read their blog about what I do there and the whole fixed gear/track bike culture that's exploding in every major city nowadays. I'm not a total bike geek, but definitely has an appreciation for it and find this particular subculture really interesting. But apparently my Diagonal graphic is a big hit in Japan! It's pretty exciting. I think it's because of the hot pink and electric purple combo. They just LOVE crazy colors! As you can see in the photo below with our dear friends and distributer in Japan, Seiya and his ADORABLE family in BRIGHT cheerful colors! 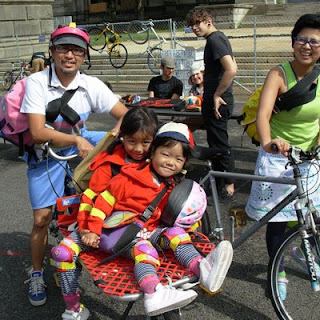 We got to hang out with them at one of the major bike races in Philly and they're just the cutest family ever! 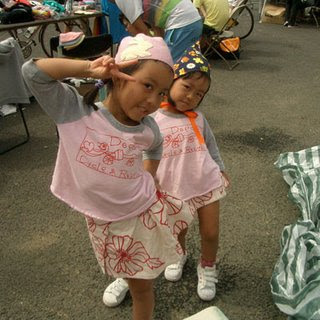 I wanted to steal little Aika and Yume from their parents...but decided not to, since their parents would be sad. Hope to visit them at some point. it's been more than 3 years since I've last took a trip to Japan. I miss it there. gotta save up! Last Saturday morning Dylan and I went downtown and treated ourselves to some great smooth Italian lattes at Cafe D'arte on the corner of 2nd ave & Pine street. This is one place where the coffee is somewhat comparable to the ones we had in Italy, and one of our favorite cafes in Seattle. This little understated place with outdated 90's decor reminds me even more of the cafes we've been around Rome....only thing missing is all the old Italian guys that hang around by the bar drinking their cappuccino and eating a cornetto. Cafe D'arte is a place with no fancy art displayed, no indie music playing, and no cozy couches what-so-ever for you to lounge and want to spend a whole day working on your laptop. What Cafe D'arte DOES have, is great Italian coffee and amazing baristas that make satisfying lattes with pretty Rosetta, and the most adorable face on the top of the latte! you can see in the top right corner of the photo.....looking at you and smiling oh so enduringly. I didn't want to drink it since it was smiling at me! But then.......I didn't want to drink a cold latte either, so I took a photo of it and had to say goodbye to the kind face made with steam milk and coffee....goodbye....my sweet love. Oh it does not end there with this coffee even though it was enough to make my day. So after we got our coffee we walked a couple blocks to one of the Tom Douglas-owned bakeries, Dahlia bakery, on 4th ave and Virginia street. We never come here nearly as much as we should. Everything in the bakery is very affordable, which is atypical of all the other Tom Douglas' restaurants. Don't get me wrong here, I love all the all the Tom Douglas restaurants I've tried, but they're just not usually a casual-walk-in-and-out-and-can-get-some-small-bites-under -$40-per-person kind of a place. So the bakery was perfect for a Saturday morning. and we got a select variety of pastries and all for under $15. The bakery makes everything from pastries, desserts, pies, cakes to bread, soup and sandwiches. Looking at their menu makes me wish that I can try a bite of everything since everything sounds so amazing. Did I mention that I'm a sucker for pastries!? or for food in general??? well...I am! as you can see, we got a savory leek and gruyere pastry, a big juicy pear pastry, and TWO mini carrot cake cupcakes. I don't usually eat cupcakes for breakfast, but I couldn't afford NOT to! Just look at all these things....golden flaky buttery goodness, and the smooth thick cream cheese frosting topped with walnuts....HEAVEN!! I wish it was closer to us so I could try everything....but maybe it's better this way, because it'll feel so special the next time we go that I'll write a whole 10 page paper about it. Hi everyone, this is Dylan, Jean's bf. Jean and I really dig abandoned, dilapidated, and generally run-down buildings. Whenever we travel, we make it a point to try to find the areas of our location that may have abandoned sites that nobody really cares about. There's something about being there documenting a forgotten place that fascinates us. I'm going to blog about them from time to time. 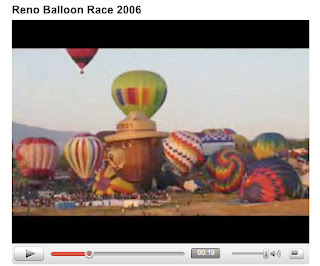 There's also balloons of Smokey the Bear, bumble bee, and Jesus on a cloud.... AH-MAZING~!! WOW! 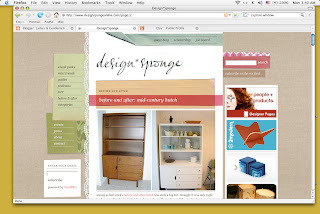 I just found out that L&G was featured on design sponge!! I'm a HUUUUGE fan of D*S Blog and so this is a great honor to be featured on there along with all those other amazing stuff. I was practically jumping off the wall when I saw my store featured on there, especially when I only started L&G a week before the posting! This is super encouraging! 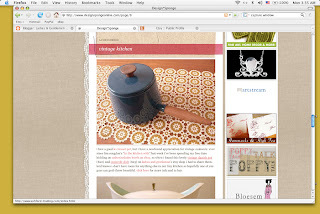 The posting was on Jan. 24 titled 'Vintage Kitchen'! 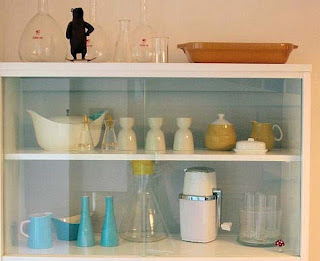 and then a posting on Jan 31st Titled 'Before and After Mid Century Hutch,' in the top left corner there's the same Taylor Smith & Taylor casserole dish I sold on L&G! 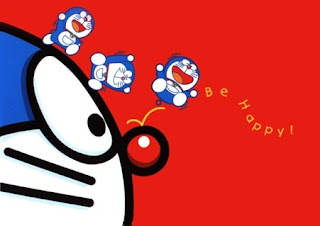 I was wondering how the number of people who hearts my store went from less than 20 to 160!!! I think it was all because D*S.....well...I know it is! So this is one of the first craft project of the year that I made for my close friend, Noal, who moved away to L.A. last Friday. I'm super bummed about him moving away, since we've been friends for 6 some years now. We'd watch indie/foreign films, drink tea or coffee, shop at the farmers market, go on art walks, ride on scary rides at Seattle Center, go thrift store shopping, and try new restaurants, etc. We pretty much do everything together....second to Dylan. But I suppose now this gives me an excuse to go visit him in L.A.!! I need some sun light soon. So as his going away gift, I made him a CD case that fits 8 CDs with CDs such as The Darjeeling limited sound track, The new Shins, Nick Drake, El Perro Del Mar, Jenny Lewis and the Watson Twins, The New Rilo Kiley, Toya (pre -Benyonce booty shaking music), Flight of the Conchords, and Thom Yorke. The format is like a folding accordion folding book with pockets on both sides that can fit 8 CDs. First, fold the pocket piece in half the long way, and iron it flat. 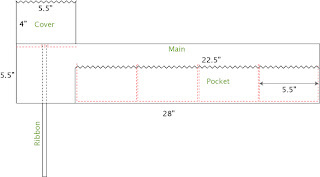 At the fold, insert the main piece so then the pocket sandwich the main piece in between. then mark lines 5.5” apart with 1/8” in between. Then in one continuous stich, sew down the pockets. as shown in the drawing below with red dotted line. Take the ribbon and stitch down the center of the back. Then with the front of cover facing the back of the main piece, line the flat edge of cover with the top edge of main piece, stitch it down, and fold it over and top stitch it. Then the last step is to pick out your buttons and sew it, and you done!! TA-DA!! you can make bunch of different variations depending on the fabric, ribbon and buttons you use. Also if you want more pockets, just add 5" 5/8 to the length for each additional CD slot, then you can fit as many CDs as you want! EASY!! Well actually...our REAL intent here is to post things about random interesting objects we find, places we go, food we make and eat, people we meet, art we see, and projects we do. Currently we're taking a wheel throwing class at the local Green Lake community center. It incredibly satisfying to go from a blob of clay to a tea bowl or a cup. I'm just starting and is still trying to get a better control to make more shapes. So we'll be posting more about soon.